Arctic char is similar to salmon, with beautiful rosy flesh, a tender, flaky texture, and a sweet buttery flavor. It has the added bonus of being listed as a “best choice” selection by the Monterey Bay Aquarium’s Seafood Watch program, which encourages consumers to buy fish and shellfish that are not endangered and that are environmentally friendly. I learned this superb slow-roasting technique from my friend Diane Morgan’s book Salmon. Cooking the fillet slowly at a low temperature produces a wonderfully succulent, deeply pink fish. It is a perfect dinner party centerpiece. Place the char fillet, skin side down, on a large rimmed baking sheet lined with parchment paper. In a small bowl, mix together 2 tablespoons of olive oil and the fennel pollen. Drizzle the oil mixture over the fish and rub it in gently with your fingertips. Season the fish with a little salt. Set the char in the oven to roast for 25 minutes. While the char is roasting, sauté the fennel. Put the remaining tablespoon of oil and the butter in a large skillet and set the skillet over medium heat. When the butter is melted and begins to sizzle, add the sliced fennel and stir to coat it thoroughly with the butter and oil. Sauté the fennel for 8 to 10 minutes, or until it is just tender. Raise the heat to medium-high and pour in the Pernod. Cook, stirring for a minute or so, until the Pernod has evaporated. Stir in the fennel fronds and cream. Boil briefly, until the sauce has thickened slightly. Turn off the heat and cover the pan to keep the fennel warm. Check the fish for doneness. It is done when an instant-read thermometer inserted in the center registers between 125 and 130 degrees, and when the flesh is opaque pink and flakes slightly. The flesh should be barely firm to the touch and not at all hard or dry. Using two wide spatulas, carefully transfer the char to a large serving platter. 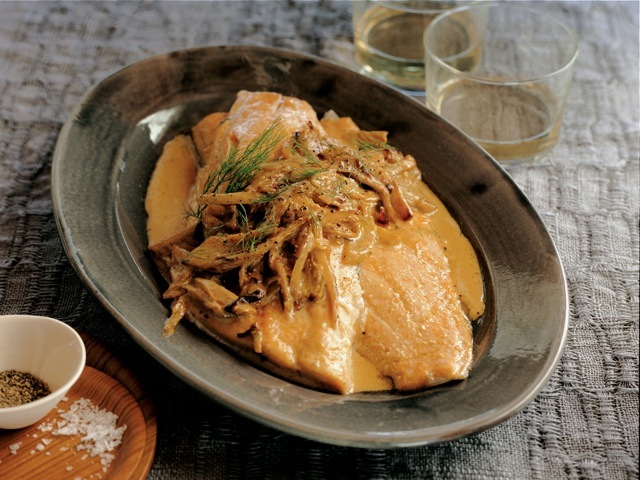 Spoon the warm sautéed fennel over the fish and serve immediately. Fennel pollen is the pollen collected from wild fennel. It is harvested in Italy and in California and is, like saffron, quite expensive. However, it has a unique, heavenly aroma and distinct flavor, with hints of anise, saffron, and curry. Also, a little goes a long way, so if you do splurge, use it sparingly and it should last you a while. You can substitute 1/2 teaspoon finely crushed fennel seeds and the tiniest pinch of curry powder. Pernod is a liqueur produced in France that gets its flavor from star anise and the licorice plant. It is enjoyed as an aperitif but is also used in cooking and baking. The fennel can be sautéed up to an hour in advance up to the addition of the Pernod. A few minutes before serving the fish, reheat the fennel over medium heat. When it is hot, turn the heat up and add the Pernod. Finish with the addition of the fennel fronds and cream as directed.